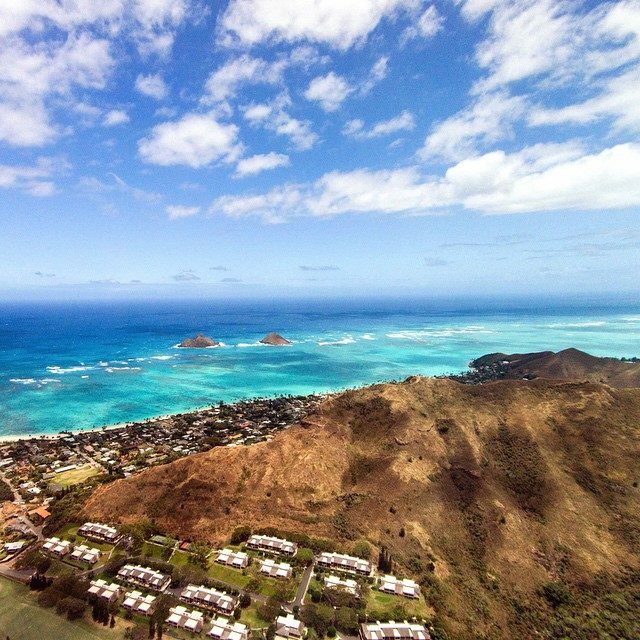 Kailua Oahu, Hawaii consists of a small, residential community and luxury homes market in Windward Oahu real estate. It occupies a location north of Waimanalo, astride the Kailua Bay. The community includes gorgeous beach fronts, green spaces, parks, trails, preserves, the Ka’elepulu Canal and Pond. Kailua real estate includes gorgeous homes at various levels of luxury and astride these many stunning features. The water of Kailua Bay meets with pristine, white sand in vibrant turquoise shades. Kailua Beach meets with a warm sense of welcome in Kailua Town. In the small center, a hometown feel with the accent on a resort lifestyle showcases boutiques, restaurants, local hangouts and Thursday evening farmers’ markets. Amid this heartwarming, laid-back and engaging back drop, residential neighborhoods showcasing numerous homes, span a large percentage of the community. For those interested, homes for sale in Kailua can be found at the beach and around Ka’elepulu Pond. They can be found up against expansive Kawainui Regional Park and aligned with the Mid-Pacific Country Club and Golf Course. In fact, everywhere they may appear, homes for sale offer an accent on gracious, upscale living and incomparable, tropical island ambiance. Kailua real estate often includes homes on generous lots or acre plus grounds. Real estate includes both established and newer homes. Many available homes often easily exceed the $ 1 million dollar range. Although, highly desirable homes for sale in Kailua also appear under that amount, making for versatility in the market with a variety of buyer types, age groups and family sizes in mind. A genuine sense of serenity and belonging accompany living in the community. Homes for sale in Kailua offer unique experiences in high quality of life and real estate choices. The good life, island style does not get much better on Windward Oahu in Kailua. Find out more. Get details on real estate including premier locations, luxury amenities and homes for sale, using the unique lifestyle search on KimiCorrea.com. Contact area expert, Kimi Correa for more information. If you like Kailua, you may want to check out my Waimanalo Homes For Sale page and my Kaneohe Homes For Sale Page. Two contiguous A-2 Zoned lots with 8 two bedroom units in desirable Kailua town, 707 and 703 Kihapai Place. The structures are 4 duplexes total, 2 duplexes per lot. Current income is below market, projected rent is $1850/month per unit. 8 electric meters. One water meter per lot. TMK 1/4/3/058/040/0000 and TMK 1/4/3/058/041/0000 to be sold together. Tropical living at its best! Tradewinds gently drift through this wonderful beachside home. The spacious open floor plan flows to a large covered lanai & huge walled garden. Lots of room for a pool. Miles of granite counter tops in the lovely renovated kitchen. Bamboo floors. A spacious 2nd floor master suite includes a charming lanai w/ocean & mountain views. Expansive 631 sq ft garage & workshop & a 650 sq ft cottage. Main house has 4 bedrooms & 2.5 baths. Cottage has another bath.The quintessential Kailua Beach Home. Kaapuni is one of the best Beachside streets, is a private street w/an owners association ($850 per yr). Click on the video icon for a slideshow, on that screen click on MORE INFO, from that menu click on floorplan walkthru to walk yourself thru the property. Celebrate living in this truly distinctive five bedroom, five and a half bath Lanikai home where timeless sophistication integrates seamlessly with island style. xD; xA;Floor to ceiling windows capture a feast for the eyes: Mokulua Island highlighted by the sun, surf along the reef and whales beyond, zen-like gardens complimented with black bamboo, banana, lilikoi, and yellow red mangoes ready for picking. xD; xA;Flexible floor plan offers many living configurations; interior and lanai spaces seamlessly integrate for social gatherings and private introspective moments. Loads of additional storage for the organized. xD; xA;Steps to world renowned Lanikai Beach yet a short distance from Kailua town and Honolulu, this home is ideal as a primary home, vacation home, long-term investment or rental. You will find an excellent value in this beautiful custom home on oversized lot of 19,946 sq.ft. Plenty of room for extended family living. The property includes 3 bed/3.5 baths PLUS a permitted 2 bed/ 2 bath ADU above the 4 car garage w workshop. Many custom features including travertine & hardwood flooring throughout, hand carved mahogany wood panels, custom hand painted tiles & a kitchen that will satisfy the most discriminating culinary lover w top line stainless steel appliances. The property is graced with a heated, salt water pool beside a cabana fully equipped for all your entertaining needs.Located in close proximity to Kailua Beach and the many amenities Kailua town has to offer.Perfect multi-gen estate! Paradise found. Developers have designed house-lot packages & general contractors avail. to consult w/ to customize your new home. All high-end homes to be built w/ estate sized lots in private community of Maunawili Summit in Kailua. Stunning Ocean, Olomana Mountain, Golf Course, & Koolau views. Mesmerizing stargazing & moon viewing at night. A total of 5 lots. Tranquil & quiet, w/ no neighbors, mountain side of the project. All lots a min. of 2 acres. 4 lots behind a private gated entry on Lopaka Way, 1 lot at the end of a cul-de-sac on Lopaka Place. Centrally located w/ short drive to beaches & downtown Honolulu. CPR approved. Ready to accept purchase contract. Also, see MLS #s 201720025,201720027,201720074,201720075, 201812305. See virtual tour & website by clicking on reel icon. Welcome to this lovely Kailua beachside pool home in the coveted neighborhood of Kainalu Park. 5 bedrooms 3 baths with private gated access to one of the best beaches and surfing spots,Castles. Owned photovoltaic system makes your electric bill very low. The property is professionally landscaped and irrigated for easy maintenance. Welcome to 102 Kaiolino way in the exclusive Kailua beachside community. Fall in love with the heated turquoise tiled pool & tropical landscaped grounds as you drive in your front gates. Enjoy the expansive indoor/outdoor floor plan with formal & casual living areas, vaulted ceilings and custom features throughout. This beautiful 3 bedroom & 3 bath home has multiple living areas and workspaces. Amazing spa-like bathroom in the master bedroom complete with a beautiful custom designed monkey pod countertop. Large kitchen with granite counters, quality appliances, open beam ceilings and underground utilities. There are 46 photovoltaic panels on the roof in optimal sun. Short walk to the beach using the private deeded access gate or take your favorite watercraft down the canal into the ocean. Paradise found. Developers have designed house-lot packages & general contractors avail. to consult w/ to customize your new home. All high-end homes to be built w/ estate sized lots in private community of Maunawili Summit in Kailua. Stunning Ocean, Olomana Mountain, Golf Course, & Koolau views. Mesmerizing stargazing & moon viewing at night. A total of 5 lots. Tranquil & quiet, w/ no neighbors, mountain side of the project. All lots a min. of 2 acres. 4 lots behind a private gated entry on Lopaka Way, 1 lot at the end of a cul-de-sac on Lopaka Place. Centrally located w/ short drive to beaches & downtown Honolulu. CPR approved. Ready to accept purchase contract. Also, see MLS #s 201720025,201720027,201720074,201720075, 201812320. See virtual tour & website by clicking on reel icon. Location! Location! Location! Rarely available corner lot right across street of Kailua Beach Park! Just steps away from one of the most famous and beautiful beaches in the world! Bring your own contractor and build your dream house here on the big 12,360sf land! Enjoy the breathtaking ocean view and sunset! Great investment opportunity as a vacation home. HUGE PRICE REDUCTION for the house on the Hill overlooking Lanikai. This vantage point is all yours to enjoy. The exquisite, unobstructed, awesome ocean view with the Mokulua Islands at center stage belongs to you. The view and the privacy of the land is unsurpassed. The land consists of 11,380 sf of residential land and 57,238 sf of preservation land.The preservation land ascends up towards the pillbox. Definitely a unique property. The home will need your TLC or full renovation. Don't let this one of a kind property get away. Presenting Ka Hale Kahakai, a custom-crafted Kailua home one block from sandy beaches & stretching shorelines. Reconstructed & upgraded in 2018 with high-end finishes & fine details, this sprawling tropical home features a 3 bedroom, 2 bath main home with a separate 1 bedroom, 1 bath guest cottage. Kailua Town Center, Whole Foods, dining, shopping & entertainment are just a few blocks away; easy freeway access to Ala Moana, Hawaii Kai & more. With Kailua Beach just across the street, enjoy water sports, beach activities & the island-lifestyle in paradise!